Each year, hundreds of thousands of people visit famous battlefields of the Revolutionary War and U.S. Civil War — Bunker Hill, Gettysburg, Bull Run. But there have been other bloody conflicts on American soil — such as the Hawaiian Civil War and the French and Indian War — not as well-known, and their battlefields are rarely visited. The 19th-century Rogue River Indian War is another conflict lost to history for most people. It started with an uprising of natives against miners and other settlers in southwest Oregon in the mid-1850s. There were massacres, reprisals, pitched battles and a final forced expulsion of tribes from their homelands to distant reservations. Looking back, two things stand out. Artifacts from the mostly forgotten battles lie just beneath the surface. So, too, does interest in the conflict by descendants and neighbors. 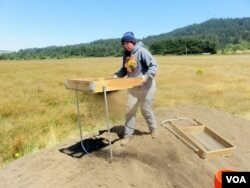 A team organized by Southern Oregon University just wrapped up a monthlong excavation of two sites near Gold Beach on the Oregon coast, part of an effort by battlefield archaeologists to resurrect one of the many conflicts that shaped the American frontier. One site is a former homestead where a family of German immigrants was slain or taken hostage by tribal warriors. 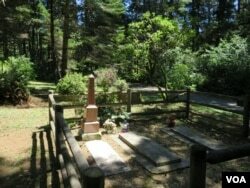 Today, only a family cemetery remains for visitors to see at the forested, 1.5-hectare Geisel Monument State Heritage Site. A few miles away, archaeologists led by professor Mark Tveskov uncovered the foundations of a crude earthen fort. Here, native forces laid siege to more than a hundred settlers and miners for a month until the U.S. Army arrived and beat the tribes back. "You can see things you can't get just from the written word," he said, explaining the importance of the material record. "Like the desperation of the people at Miner's Fort is not captured in any pioneer memoir where they crafted a kind of heroic picture of what happened. Here, we can see them cowering in a cabin, being rained on by musket balls, burning their wagons and whaleboats to the last piece of hardware." The investigators say they were surprised by how many artifacts they found in this pasture. 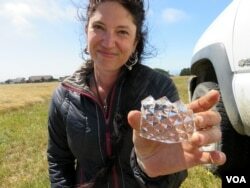 Project archaeologist Chelsea Rose shows off one of her favorites, a broken chunk of imitation cut crystal. "I love these because they are absolutely impractical. They're heavy. They're bulky. They're breakable. They're everything you wouldn't think you'd want inside this fort." But Rose says she can relate to the unknown frontier family who, in their moment of desperation, chose to flee with a cherished leaded glass bowl, because she's also had to flee her home. "I have had to evacuate twice for [wild]fire. And what did I bring? Basically, the equivalent of this — like photo albums, paintings — you know, nothing practical." Miner's Fort produced huge numbers of musket balls, nails, a few musket parts, trade beads, bottle stoppers, pottery shards, crucibles and little pieces of lead type. Apparently, a set of movable type from a printing press was being melted down to make bullets and lead shot. Rose said the excavation unearthed animal bones broken into tiny pieces, which showed the besieged colonists were desperate to extract every last bit of nutrition from the food they had. The researchers avoided uncovering human remains. While the archaeologists and summer field school students work, they receive a steady trickle of visitors bearing questions, stories or artifacts collected long ago. The cultural resources director for the Siletz Tribe visited several times. Robert Kennta says for tribal folks, the history of the Indian war "is not that old." His grandmother's father lived through it. "That's very fresh in our family stories, how he by some miracle was able to survive the wars as an orphan boy, spending that last winter in a kind of hollowed-out sugar pine snag, just scraping by." Kennta says it's difficult to be reminded "of all the suffering people went through on both sides." But he and other tribal visitors came to support the excavation. "It's part of that reconciling of the past with where we're at today and understanding what your family has been through and your whole community has been through. In some ways, it can help you navigate toward a healthier future." It's these kinds of reactions that motivate archaeologists Tveskov and Rose. "Everything we do as archaeologists, we're always trying to get back to the people," she says. "All these artifacts are fun to look at, but really they are a means to an end. That is to tell the human story. " Last month, the National Park Service awarded Southern Oregon University nearly $100,000 to survey several more Rogue River Indian War sites and then seek a National Register of Historic Places nomination. Tveskov hopes this eventually raises the profile of the battlefields and leads to better conservation and interpretation.